If you’re not reading Young Animal’s Shade, The Changing Girl, you’re missing out on one of the year’s best comics. Written by Cecil Castellucci with art by Marley Zarcone, inker Ande Parks, and colorist Kelly Fitzpatrick, this series is a complex exploration of teenage alienation and quarter-life crisis, presented with psychedelic visuals that are constantly experimenting with layout, texture, and color. Castellucci is building off of established Shade, The Changing Man mythology but taking the concept in a new direction targeted at female readers, and her understanding of teenage personal dynamics and the existential ennui of people in their 20s gives the book considerable emotional depth. The alien Loma Shade is a compelling lead character looking for a place to belong but unable to commit to lasting relationships, and when she sours on her Earth experience as a high school student, she flees that life to lose herself in the city. Gotham City, to be exact. 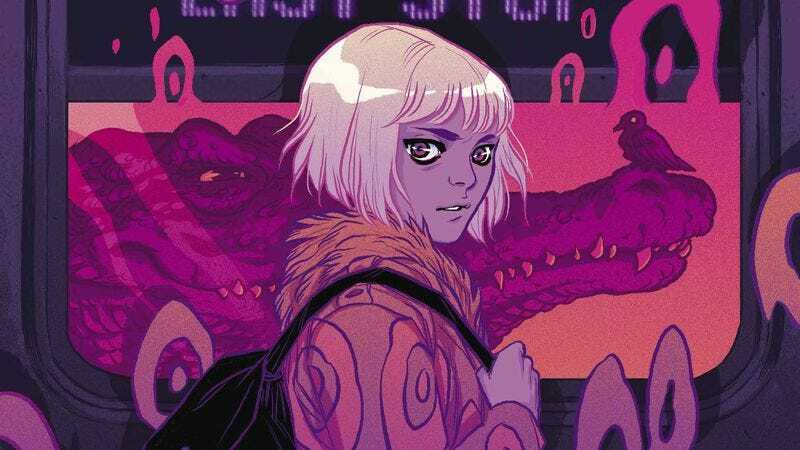 This exclusive preview of this week’s Shade, The Changing Girl #8 introduces Shade to her new urban environment, and as she becomes comfortable in this new setting, the dull grayness of the city begins to give way to brighter, more surreal visuals. Zarcone and Fitzpatrick’s artwork is very subdued at the start, and it makes Shade stand out with her rainbow-colored coat and white hair. When the story jumps to Shade’s home planet, there’s an explosion of colors and patterns that don’t appear on Earth, reinforcing the alien nature of this setting while adding visual spectacle. Also included in this preview is the latest “Life With Honey” back-up, which teams Castellucci and Fitzpatrick with artist Audrey Mok to recount an episode of the classic TV show that gave Shade a very outdated opinion of Earth. These back-ups combine I Love Lucy-style sitcom high jinks with an undercurrent of Atomic Age dread, and Mok’s clean, cute artwork brings a lot of charm to the short story. The attention to detail in this series is outstanding, and these back-up stories are fun extras that also inform Shade’s thought process and how she interacts with the people of Earth.